Fan involvement is one of the main topics of this year’s Football Collective. The overarching theme of the 2018 edition of the conference is ‘Challenging the Narrative’. As an example of that theme, fan involvement is one of the main issues being discussed and was the focus of presentations by Andrew Jenkin and Joshua McLeod. Andrew looked at the growth and future fan ownership of football clubs, whilst Joshua researched the potential of ‘fan directors’ within the sport. Speaking about the growth of fan involvement, Andrew said: “I think supporters are one of the biggest, if not the biggest shareholders of any club. “They are the ones that make the club tick, generate income and have been there for the longest. Joshua, a lecturer at the University College of Football Business, spoke about the increasing number of ‘fan directors’ in football, with 18 clubs in Scotland now utilising them: “Most (fan directors) are accepted onto the board. “I think there are some cases where it is tokenism and the other directors on the board don’t take them seriously and they aren’t given legitimacy. 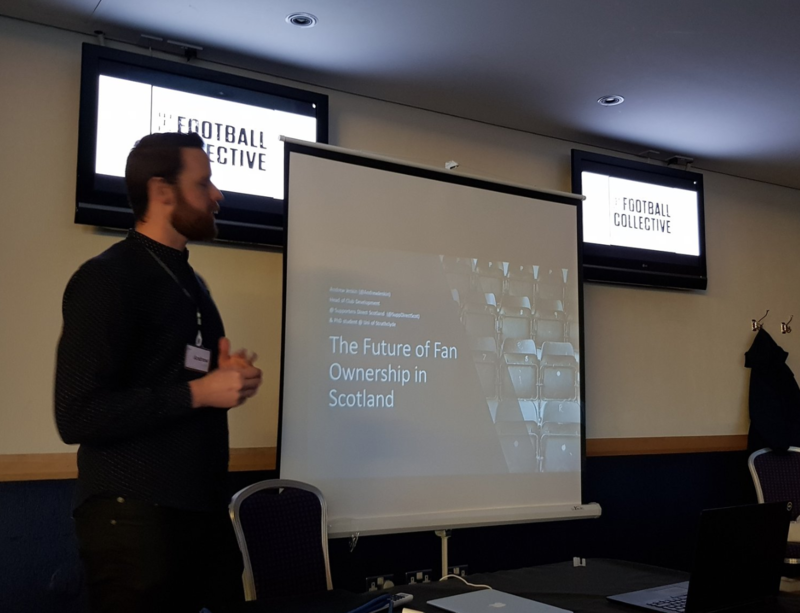 Andrew, a PhD student at Strathclyde University, also spoke about the growth of fan ownership in Scotland, with 12 clubs going into administration since the year 2000. “The financial situation of Scottish football has a large part to play in it (the rise of fan ownership”, he said. “A lot of clubs went through financial difficulties and there were a lot of instances where there were no potential buyers forthcoming. “The Foundation of Hearts have gone through that process, Stirling Albion has too. So I think other clubs will want to follow suit. Joshua added: “There’s a much greater realisation in Scottish football about the type of finance available to Scottish clubs. It, therefore, seems certain that fan involvement will continue to rise in Scotland. This post is part of a series of articles from the University of West of Scotland Sports Journalism students who are covering the Football Collective’s “Changing the Narrative” conference in Glasgow, at Hampden, Scotland’s National Stadium.